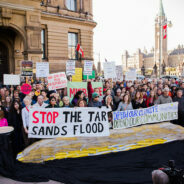 Rallies took place across Canada. We had a good group out and sang two of our three songs against pipelines for an enthusiastic crowd. Unfortunately, the photo below hides and cuts off some of us. You can see (sort of) Jo on the left, Bessa with the megaphone, Jake behind, Pat out front, Diana out of costume, Loris and Sobian. Out of camera are Linda, Gale, Jeanette and Terrie. Posted by Jo on May 26, 2013 in Actions | Comments Off on Grannies are a welcoming committee for healthcare summit. When we heard about an emergency summit to stop privatization of healthcare, we decided to be at the door to welcome those attending. Public healthcare is under serious threat and we have several songs on this topic written over the years but still relevant today. We handed out the songs and invited people to sing along and many did so. When the meeting started, we took our seats and heard excellent presentations on the urgency of the situation, followed by a call to action. Get the full writeup by Koozma who also took the great picture of the Grannies. 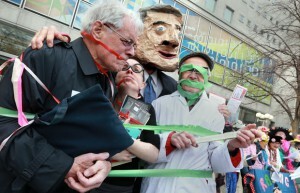 We watched in horror while Stephen Harper placed gags on scientists, librarians and backbench MPs. 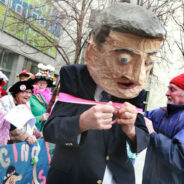 But the Grannies couldn’t be muzzled (Harper tried). Instead, they sang about this outrage before chasing Stephen Harper away. Check out the words to Song 1, Song 2. See photos by the Ottawa Citizen here. 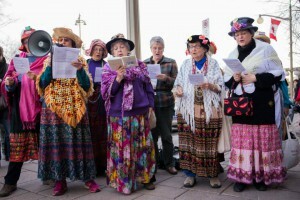 Raging Grannies held a rally for muzzled scientists, librarians, and MPs. Federal librarians and archivists are facing a new code of conduct in which they need to clear what they will say in high risk activity such as speaking in classrooms, attend conferences or speak up at public meetings on their own time. According to the code, they owe loyalty to the government and should report anyone heard violating it. When MP Mark Warawa was struck from the list of backbenchers who were scheduled to deliver a member’s statement in the House because the topic had not been approved, he complained that his freedom of speech was being violated. Back benchers are beginning to speak out about being muzzled. When asked to perform at FEMICON, we indicated that we are an activist group, not a choir. But we wanted to support International Women’s Day, so we offered to talk about song writing instead. The organizers agreed. So, in front of a packed auditorium, we explained who the Raging Grannies are, how we decide on issues, and how we write our songs. For example, we mentioned how we want to use satire and bring current events into our songs. To keep things lively, we donned our Granny outfits on stage and unfurled some of our recent banners while talking. We then sang a song, It’s a Long Way to Women’s Freedom, specifically written for the event. Lots of cheers and calls for an encore, but we left while we were ahead! Following the drastic cuts to health care both in acute care and long-term care hospitals, the Ottawa Health Coalition organized a rally in front of the Civic Campus on March 4. Five grannies, Bessa, Cathleen, Gale, Jo and Pat showed up with two songs directly to the issue. The organizers let us open the show and were appreciative of our efforts. Check out The Medicare Song and Get Sick, You’ll Make Somebody Richer. A small group, Cathleen, Gale, Linda, and Jo went to the Department of Fisheries and Oceans to say “Save the Wild Salmon” who are getting diseases and dying because of the fish farming on the coast of BC. Most of it is done by 3 large corporations from Norway who have come here because of our lax laws. They couldn’t do it there! The future of wild salmon continues to be fatally compromised by industrial practices that dump toxic waste in wild salmon habitat. The salmon farming industry has planted itself in the migratory paths of wild salmon around the world, taking no responsibility for the deadly outbreaks of parasites and disease that pass through the open-nets of the salmon farms to wild salmon as they swim by. In spite of every claim by the salmon farming industry that “best husbandry practices” are used, the problems that come with salmon farming have not gotten better. Sea lice have become resistant to treatments and disease outbreaks continue to be a problem. European viruses that are directly related to salmon farms have been found in wild salmon stocks. Numerous wild species are dependant on the return of wild salmon each year; Indigenous communities consider wild salmon to be the life blood of their people; and BC’s ecosystem would die without wild salmon. This industry is a death blow to all of that. Salmon farms in B.C. are 92% owned by the Norwegian companies Marine Harvest, Cermaq, and Grieg. People from around the world are uniting to protect wild salmon, marine species, the environment and all its inhabitants, with a firm message to Norway and the government: there is no acceptable place for the Norwegian owned salmon farming industry to make its profit while wild salmon, the ecosystem, and communities suffer the negative impacts. 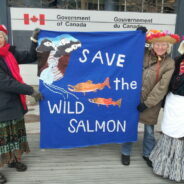 Let the governments and industries know that we will not stand idly by while wild salmon are being compromised to death! The fifth annual White Poppy Ceremony took place today at 12:45 pm without a hitch. Whereas there were more people from the 11:00 am ceremony milling about the Cenotaph than former years, there was no police presence at the north side so tension was reduced and people were quiet and respectful. 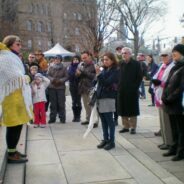 Pat and Bessa spoke after the laying of the wreath, in addition to Brenda Carr Vellino, Heather Menzies and several others, all evoking peace and co-operation as an alternative to combat. Heather read John McCrae’s iconic poem, In Flanders Fields, interpreting it as a lament and not the bellicose call to war which most of us learned in public school. This year’s White Poppy Ceremony lasted longer than other years since more people spoke and as such, passersby had opportunity to stop, listen and discover an alternative to the jingoistic bombast of the earlier ceremony. 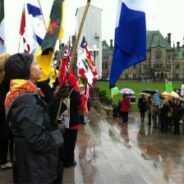 On November 1, 2012, Canadian Grandmothers supporting African Grandmothers rallied in support of Bill C 398 intended to make inexpensive medicines available in poorer countries. On a rainy day in Ottawa, they gathered on the hill for a touching rally. 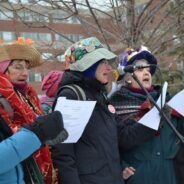 The Ottawa Raging Grannies joined them and took to the stage at the end to sing three appropriate songs: The African Grandma, Get Sick, Give them Access. This was greatly appreciated. The young people organized Powershift 2012. More than 1000 came to hear inspirational speeches, panels and workshops. On the final day, Oct. 29, the grand finale was an amazing march of young and old alike. There were great banners and puppets and skits. Check out some of the photos. 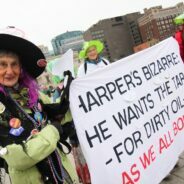 The demand of the march was to end the 1.4 billion in subsidies to the oil industries here in Canada. The Grannies were in full support, wearing our witches hats and carrying a very appropriate banner. 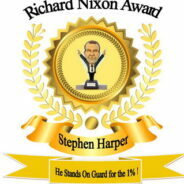 On September 27, 2012, Stephen Harper was in New York City to receive the “World Statesman of the Year Award” from The Appeal of Conscience Foundation, a U.S. faith group. The Grannies along with Author Yves Engler presented an alternative award on the same day, using the empty chair approach pioneered by Clint Eastwood at the Republican National Convention. Yves read the reasons for presenting this prize to Harper. Primarily, it is because he “stands on guard for the 1%”. Read the full citation here. The Grannies then sang a song specially written for the occasion. See the words to the song or watch the video.